Upon looking at e. e. cummings’s poem, “in Just-”,perhaps, two features immediately become apparent: the use of white space between some words and lines, and the multiple use of a single word supporting an entire line. To a lesser degree, the poem’s visual also features the boys’ and girls’ names joined together as though they were each one, and the capitalization of the “m” in “balloonMan” towards the poem’s end. All these features contribute to how the poem will be read, and when the poem is read, the sound, furthered by alliteration, assumes an alternating rhythm of excitement and measured awareness. That is, an accelerated tempo that reflects the excited manner of child-like exuberance for springtime revelry, and the lull in tempo that is attributed to the measured awareness or ambivalent feelings felt towards the “ goat-footed balloonMan.” The poem’s rapid and then measured tempo creates an artistic tension that coincides with the speaker’s account of a remembered spring. By employing white space, alliteration, compressed conjunctions, and some unconventional capitalization, e. e. cummings creates a dream vision of a remembered springtime- revelry that reads with both excitement and a measured awareness. 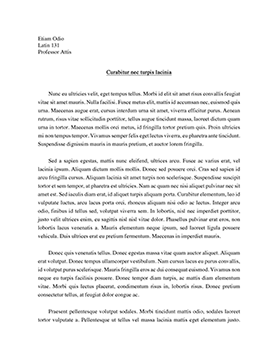 White space is used after the first line, “in Just-”, by cummings to emphasize the speaker’s observation that only in spring do the following things happen. The white space after “spring” in the second line suggests that the speaker ponders first what his audience later learns to be a springtime memory . The white space is quite obviously used for the benefit of someone listening to the poem being read. The white space in the first line between “Just-” and “spring” of the second line builds suspense when the reader pauses to simulate white space, and again, after “spring” when a child-like description defines what is uniquely available only in the spring. That is “when the world is mud- / luscious”(lines 1-2). Almost immediately cummings uses white space to direct the sound and rhythm of the poem that is not unlike conversation. ...rbles and / piracies and it’s / spring”(7 -9) or the alliteration found “from hop-scotch and jump-rope”(15) ,wish to return and repeat it because the lines are fun to say. This pleasant effect must be attributed to the speaker’s springtime revelry who also must wish to return to these activities if not for the constant stressful reminder of “the queer/ old balloonman [whistling] / far and wee”(11 - 13). The poem’s conflicting tempos add tension to the speaker’s springtime memory, but the slowing of the tempo through cummings’s use of alliteration focuses the audience on the two emotional elements: springtime celebration and the ambivalence felt towards the ever-present “balloonMan”(21). “in Just-” is probably a good example of a free-verse poem. The poem’s visual appearance might be compared to a page of dialogue within a drama-script . What makes cummings’s poem better is the direction given to the reader, such as the odd capitalization to suggest an accented syllable, or the white space to imply a pause, better still, his use of compressed conjunctions to effect haste and emphatic tones, add the repetitive refrains for accent and syncopation and one could set this poem to music.